Refund same-day cancellation? What would you do? - Research - We are your AirBnB hosts forum! Refund same-day cancellation? What would you do? I feel torn because if I were the guest, I would not expect… but definitely appreciate a refund if something in my plans changed. 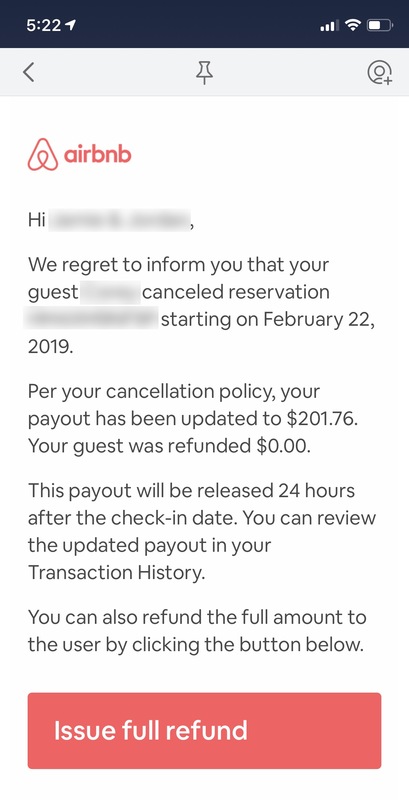 Of course, there’s the argument on our (the hosts) side, which is that now we won’t be booked for the weekend and we’re out the $200 that we would have received if they canceled sooner. What would you do?! Would you Issue Full Refund? I would only refund if I could rebook the nights. If you have a business and don’t have a business mindset then in the long term you will get very hurt. Business mindset: great product, great customer service, profit. If you don’t refund you still are offering great customer service as you are still honoring your contract with a customer who also got into the contract knowing their rights and obligations. There is nothing wrong here. I definitely agree with everything you’re saying here. That’s why I was torn… the soft side of me. We don’t neeeeeeed the money. But I also think it’s important, for the good of all hosts, that this person does not think they can just do this any time they want because people are more flexible than a hotel, for example. I’d like to hear if someone has an arguement for the other way around too. Just for equally considering both sides of the coin. [/quote] that would be my argument right there, as we are in a community of hosts. I always refund a guest if I can rebook the nights, always not even once have I kept their $ if I rebooked. Sometimes they haven’t asked for it but I took initiative to send to them via the Resolution Center. However if I did this to all of them who cancelled last minute and I didn’t rebook, even if I didn’t need the money, the frustration would accumulate on me. I would have had the place ready and so on, and on the top of that I would be creating a bad behaviour for guests in the community. Think about if we get some guests who were encouraged by other hosts some behavior that we deemed unacceptable booked our listing. Well, we might just be doing that for some other host who needs the money. No, unless I rebooked the night. They blocked out the night on a weekend and took your time and then literally cancelled about as late as one can cancel and there was no good reason. Yes, I’ve refunded some people in a similar situation but it was under $50 not $200. Not needing the money should not factor into a business decision. Say you have a job making 40k a year but you only need 30k to live on, you wouldn’t give 10k back to the company. I would say Deat Guest, I am sorry your plans have changed. We were looking forward to your stay but understand plans change. My calendar will open up for those dates now, and hopefully I can get the room rebooked at this late date. If I am able to get booked, I will send you a full refund even though my cancellation policy would normally result in no refunds. Do a partial refund and get extra Karma points. Sometimes one should do what you would appreciate if you are in the situation. It is entirely up to you. If it is not money needed and it is a better situation for the refund, then that would be an answer for your situation. It is also not wrong to not refund as well, due to the known contract. WOW! I wish I could like your comment 10x! That is such a perfectly crafted message and I hope you don’t mind that I plan to use it! I’m so glad I posted here! I fee very comfortable with this approach and feel that it perfectly articulated the message I’d like to send/offer. I wouldn’t refund them a dime unless I rebooked for the same amount. I also never tell guests they’ll get a full refund, I say I’ll refund the full amount of our payout. I’ve had people think they would get more because of the fees. Actually if someone cancelled on me an hour before checkin I wouldn’t refund them even if I did rebook. When I first started I refunded no problem. If you want a free Airbnb key ring and that’s a maybe go for it. I always take the money now. Why have a policy if you dont enforce it. Ken jump in here with some capital letters please mate! 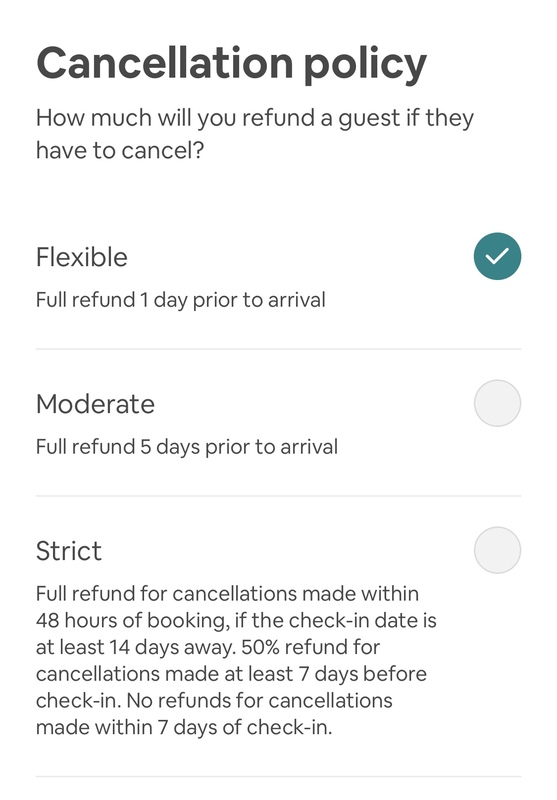 I have the same flexible cancellation policy, and also a 48-hour advance notice for reservations. My first reaction is to just let Airbnb handle it, which means they would charge the guest for 1 night, but not a cleaning fee. I could not book that night or the next night due to my advance notice setting, but at least I get paid for one of them, and there’s only a very slight chance of booking subsequent nights if the guest was staying longer than 2 nights. If the guest sent me a message begging for a refund for that 1 night, maybe I would think more about it, but your guest said they would accept any fees, so I’m not sure why there is even a question in your mind, because 1 night and no cleaning fee seems very reasonable. We don’t neeeeeeed the money. But I also think it’s important, for the good of all hosts, that this person does not think they can just do this any time they want because people are more flexible than a hotel, for example. IT’S A BUSINESS. Please follow your cancellation policy. Being “nice” hurts the rest of us that can’t afford to be as generous as you. The way to summon Ken (or anyone) is to put een @ before his (or their) name. @Ken you are summoned for help . @alwaysd8on Let me ask you a question: Imagine you go to a fancy restaurant and you order a nice platter. You wait for twenty minutes and hear the kitchen bell announcing your food is ready. You see the waiter leaving the kitchen on his way to your table… All of a sudden you change your mind: You want to go to MacDonalds, it’s cheaper and closer to your home. Furthermore, you haven’t showered in 2 weeks and you don’t want to inconvenience the other customers, so you are actually doing the restaurant a favor by leaving. Will you expect to pay, yes or no? Would you Issue Full Refund? NO, absolutely NOT ! For karma’s sake consider refunding the costs that you won’t have because of their cancelation, 5-10%? And if you rebook consider refunding a bit more, 50%? What this guest did is simply not acceptable and shouldn’t be rewarded. Being “nice” hurts the rest of us that can’t afford to be as generous as you. It’s a hazard of doing airbnb. In another thread there was a debate about the value rating and if one place had paper towels, coffee and tea and an another place that was about the same but didn’t provide those amenities, was that place a lesser value. Any time there is a post about doing a bit extra whether it’s washing all the linens each time, installing new TP for each guest, having ironed sheets, putting fresh flowers in the room…there is always pushback from hosts who can’t or won’t do those things. The reason is they feel they are in competition with those hosts. Keep the money, honey. All of it. NO. You run a business. Remember these folks are not your friends but clients and they cancelled with very little notice.